FRAMINGHAM – After 4 decades with Framingham baseball Dan Avery retired from coaching in November 2018. “Coach Avery has been involved with Framingham Baseball in some capacity since 1978 and during that time he created a great tradition of baseball in Framingham,” said Framingham High Athletic Director Paul Spear. Avery helped engineered 17 MIAA baseball tournament appearances, 5 Carey Division League Championships, 1 Bay State League Championship, and an MIAA South Sectional Title, during his 40 years, said Spear. He has been the head baseball coach since 1984. Inducted into the MA Baseball Coaches Hall of Fame, he has more than375 victories. On Sunday, May 5, the Framingham High Flyers program will host a Dan Avery Appreciation Night at the Framingham Elks Lodge. The 4 p.m. event will include dinner, drinks, and a few guest speakers to talk about Coach Avery. Cocktails at 4 p.m. Dinner at 5 p.m.
Avery retired as Activities Supervisor for the City of Framingham Parks & Recreation in January 2018. General admission tickets are on sale now and are limited. Click here to order a ticket. 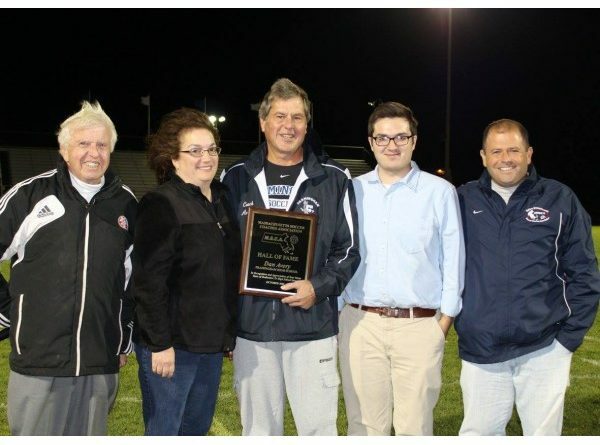 Photo of Avery when he was inducted into the Massachusetts Soccer Coaches Hall of Fame in 2015 at Bowditch Field.